There is no position MSU fans are watching more than QB. It is currently causing widespread heartburn and praying. As of right now in year 5 of the Mullen era, MSU has 2 scholarship QB’s in Tyler Russell and Dak Prescott. Mullen has seemed to be snakebit in QB recruiting with signees like Dylan Favre and Nick Shuessler leaving the program. Also add in 3 star walk on Jamil Golden who didn’t make his grades and has moved on. Lets take a look where MSU QB currently stands. Tyler Russell- 5th year senior and incumbent starter. Tyler brings a wealth of experience which includes 4,566 passing yards and 37 TD’s in his career. We know what Tyler brings to the table: big arm, accurate, smart, and leadership. It’s hard to ask for anything more than how Tyler plays and how he represents MSU. Dak Prescott- 3rd year sophomore who got his first taste of action last year. The 6’2 235 lb battering ram threw for 4 TD’s and ran for another 4 as a freshman. Dak has a big arm and his passing paired with his running ability makes him dangerous. He is currently rehabbing a turf toe surgery but will be 100% by fall. 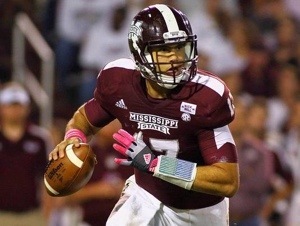 Many MSU fans are very excited about the “Dak Attack” which is right on the horizon. signee Cord Sandberg- The 4 star prospect stands 6’2 200lbs and look like a Tebow clone who can actually throw the ball. Big arm and athletic. ESPN had him rated as the 246th prospect in America. The latest scuttlebutt on some MSU premium boards is that he is headed to the MLB. I’m approaching it as if he isn’t coming but I’m holding out a sliver of hope. signee Damian Williams- 6’1 215 lb prospect out of Metairie, La that was a composite 3 star. Passed for 1900 yards and 18 TD’s while adding 874 yards and 10 TD’s on the ground. Looks to be a steal and a very good get from late in the process last year. A true dual threat QB that is set to be on campus in June. **Wild Card** possible transfer Steven Bench- Currently at Penn State but has announced his leaving. He is a 6’3 206 lb composite 3 star coming out of high school. He’s classified as a pro style QB but dropped a sub 4.6 at MSU camp last summer. He is originally from Cairo, Ga so a move to the south seems likely. He will know where he’s going in early June so he can start school first semester of summer. Bench really liked MSU in the recruiting process last year and appears to like MSU again. As of right now it appears to be an MSU and USF battle. Gotta like MSU’s chances with the depth chart. This entry was posted in Sports and tagged Football, Hail State, MSU, Quarterback, SEC. Bookmark the permalink.